The French government on Wednesday attempted to head off planned protests over rising fuel costs by announcing a series of measures to help poorer families pay their bills.A surge in the price of diesel has provoked an uproar in rural and small-town France, with citizens' groups threatening to block roads and highways on Saturday over what they call President Emmanuel Macron's anti-car policies. The "yellow vest" movement, named after the high-visibility jackets worn by protesters, is the latest to rattle Macron's centrist government. President Emmanuel Macron said Wednesday that he "heard the anger" of drivers and others complaining of high taxes and a rising cost of living, saying that "I want to understand". "There is a right to protest... but there is also the right to freedom of movement for all French citizens," he said in a TV interview. Prime Minister Edouard Philippe had ruled out earlier Wednesday any U-turn on higher taxes on diesel, considered a major source of air pollution, but promised to do more to help poor families shoulder the cost. The measures appeared unlikely however to appease the "angry vests", who have tapped into frustration with Macron's policies, seen as favouring high-earners in cities over the rural population and the poor. The leader of the protests in the central-eastern Dole region, Fabrice Schlegel, said he hoped some 1,500 cars would turn out to snarl traffic on Saturday. "We've been scorned for years; for years we've been talked down to. It's time for us, the little people, the non-political, non trade-union people, to rise up," he told a recent rally. French officials have warned they will not allow the protests to completely block access to French roads. In 2013, a protest by the Breton 'Red Caps' over an environmental tax on trucks led to running battles between police and demonstrators. The Socialist government of then President Francois Hollande eventually backed down. The price of diesel has risen around 23 percent over the past 12 months to an average of 1.51 euros ($1,70) per litre -- its highest point since the early 2000s. 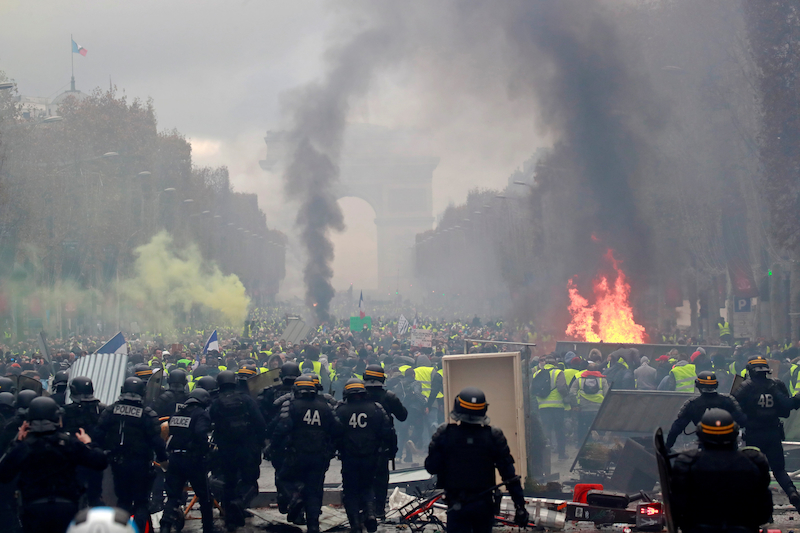 BREAKING Interior ministry officials say that one protester has been killed and 47 injured as demonstrators block roads around France to protest gas price increases. ...yet the global thugs and cucks from Brussels want to bring US LNG across half the world. Over 280,000 people took to the roads and streets in France this weekend to protest higher prices at the pump caused by a higher taxes on fuels that are part of Emmanuel Macron’s government’s plan to fight the effects of climate change. According to a Reuters report on the events, the regular French drivers don’t seem as concerned with climate change as the government: a poll conducted this weekend found that people in France preferred that the government focus on implementing policies that would help boost household income instead of fighting climate change. More than 400 people have been injured during the protests and one woman died in a tragic accident when a driver panicked at a road blockade and hit her. Even so, the government seems determined to stay the course. “The path we’ve set out on is the right one and we’re going to stick to it,” Prime Minister Edouard Philippe told a French TV channel as quoted by Reuters, noting that the overall tax burden on households would be lower at the end of Macron’s term, and the positive effect will begin to be felt as early as this year as housing taxes are cut. Still, as the protests continue, it has become clear the government and many French don’t see eye to eye on taxes. Perhaps higher oil prices contributed to the disgruntlement that led to the protests, but given that now Brent is trading substantially lower than a month ago and the protests are n full swing suggests there may be a deeper problem. The gilets jaunes are a grass-roots revolt against high fuel prices, and they threaten to paralyze France on Saturday. Last edited by goldenequity; 11-24-2018 at 06:39 AM. I think I might be color blind. Those vests look green to me. Macron was already polling lower than his predecessor..
if this doesn't bring him down then things might go full tilt. GiletsJaunes protesters nearly reached (100m) l'Elysee Palace, Paris. It's a borderline color, I'd call it green myself but you could call it yellow. Money will start a revolution even faster than the collaboration with the invaders? Better over this than never. France: Demands that Macron resign have reached television. 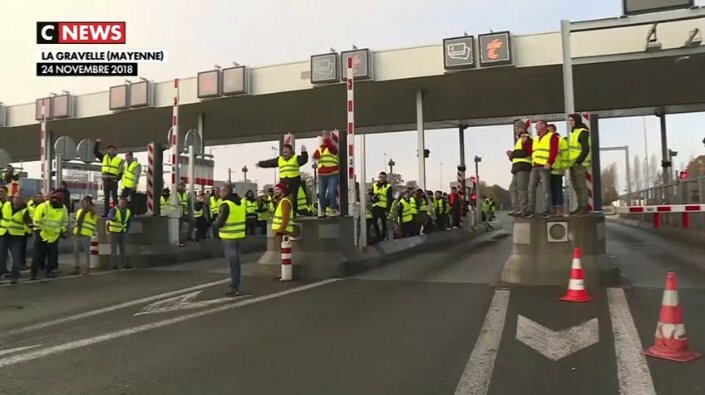 Giletsjaunes protesters have besieged a toll station in the Bretagne, France. Last edited by goldenequity; 11-25-2018 at 08:48 AM. Donald Trump piled pressure on Emmanuel Macron Sunday, pushing for resolutions to disputes on trade and defense spending, as he weighed in on the mass protests against his French counterpart's government.Writing on Twitter, Trump showed he had been keeping an eye on Saturday's demonstrations across France and refrained from showing sympathy for the beleaguered Macron, whose once cozy ties with the US president have chilled. "The large and violent French protests don't take into account how badly the United States has been treated on Trade by the European Union or on fair and reasonable payments for our GREAT military protection," said Trump. "Both of these topics must be remedied soon." Around 130 people were arrested in France on Saturday during the nationwide protests, while 24 people were injured, five of them police officers. French President Emmanuel Macron is to address his nation on Tuesday following persistent and sometimes violent protests over fuel taxes that are morphing into a movement against his business- and environment-friendly policies.Paris saw clashes between police and demonstrators Saturday on the Champs-Elysees where barricades were set on fire, luxury shop windows smashed, and traffic lights uprooted. Some 30 people were injured and 101 arrested, police said. The government blamed much of the violence on a small minority of "ultra-right" activists who shadowed the 8,000 demonstrators who were wearing the yellow, high-visibility vests that symbolise their week-long protests. "It is time to listen to the French," he said on BFM television, suggesting that Macron would call for "grassroot debates" throughout the country on government policies. The presidential palace said Macron would make a speech on Tuesday on ecological transition and was expected to address the protests. Opposition leaders have been quick to note that the protests, mostly organised by grassroot protesters coordinating by way of social media rather than by traditional political parties or trade unions, have won wide popular support. "When a movement has the backing of three quarters of French people, you give them an answer, you don't just dismiss them as a gang of thugs," Olivier Faure, the opposition Socialist Party leader told Le Parisien newspaper. Guillaume Peltier, a leader of conservative The Republicans party, told the daily it was "all too easy to stigmatise the 'yellow vests' ... and equate their movement with that of a few unacceptable acts". Far-right leader Marine Le Pen voiced her full support for the protesters, telling the LCI channel the unrest revealed grievances held by "the immense majority of the French" who were being ignored by "a miniscule cast working only for itself". Macron himself had taken to Twitter on Saturday, to condemn the violence and cry "shame" on those who assaulted or intimidated policemen, journalists and other citizens. Several media workers based in France's southwestern city of Toulouse said Sunday they would boycott the "yellow vests" movement after five journalists were threatened or beaten by scores of demonstrators while covering protests in their region. Faced with the public anger, many politicians suggested Macron -- often perceived as aloof or arrogant -- might use his speech to announce measures softening the impact of rising petrol and diesel taxes and restore dialogue with trade unions. "When you act like Louis XIV, you can expect revolts (...) The French back the 'yellow vests' because Macron promised them a new world, and they see that his policies aren't delivering," Bruno Retailleau, who heads the Republican opposition in the Senate. Bloomberg reports Europe's Diesel Woes Deepen as Strike Halts French Oil Refinery. The premium per barrel of diesel over Brent crude - another indicator of market strength - was at $15.96 on Tuesday, the highest for the time of year in six years. Amid daily protests about high energy prices, Mr Macron said Francewill shut down 14 nuclear reactors by 2035. Excuse me for pointing out that nuclear energy does not add to greenhouse gasses, not that this whole global warming scare makes much sense in the first place. Excuse me for pointing out that the diesel protest came when oil prices were falling. 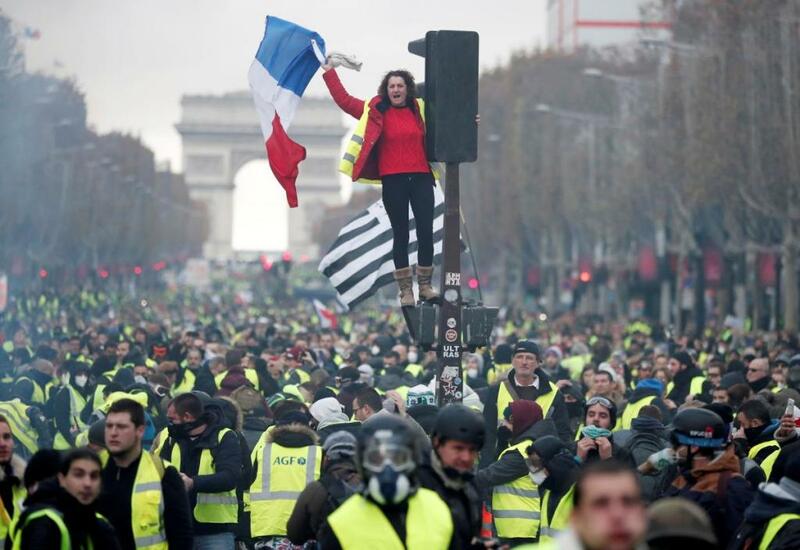 In an attempt to calm the protesters, Mr Macron proposed a three-month consultation with associations and activist groups, including the so-called "yellow jackets" who have led the recent protests, about how best to handle the rising energy costs. Yeah right. That's sure to work. Yes boiz and gurlz.. it's the WEEKEND! and U know wat that means??? that's right! Last edited by goldenequity; 12-01-2018 at 05:59 AM. Why this comes as a surprise amazes me. Hedwige Lebrun should run for office in France. Last edited by Pauls' Revere; 12-01-2018 at 11:44 PM. They need to voter harder. I can envision a lucrative consulting business for @TheTexan. Hehehe you are what you vote. I don't think I can. I've been told by my lawyers that my advanced voting techniques fall under the ITAR export restrictions. This must trouble you. It doesn't really have anything to do with the quote, but you probably should see this. The police were called, and they removed their helmets in solidarity. Anything the kops do is just fine with the Texican. So that's what they are calling it..."ecological transitioning". Which means, of course, you'll be "transitioned" out of your car, out of your warm home, out of your cheap grid electricity, out of your cheap goods from China, out of your plastic gizmos. Of course, the ruling class won't have to comply. Reason #87753 why France will never be Great. For months, the popularity of Macron has been in free fall: he is now the most unpopular French President in modern history at this stage of his mandate. The French population has turned away from him in droves. Unemployment in France is not only at an alarmingly high level (9.1%); it has been been alarmingly high for years. The number of people in poverty is also high (8.8 million people, 14.2% of the population). Economic growth is effectively non-existent (0.4% in the third quarter of 2018, up from 0.2% the previous three months). The median income (20,520 euros, or $23,000, a year,) is unsustainably low. It indicates that half the French live on less than 1710 euros ($1946) a month. Five million people are surviving on less than 855 euros ($ 973) a month. Armed rioter on the streets of #Aubervilliers. France: The ambulance drivers have blocked the lower house of the French parliament, the Assemblee Nationale, and the Place de la Concorde in Paris. In orange: service stations in partial rupture. In red: fuel stations completely out of order. Last edited by goldenequity; 12-03-2018 at 10:55 AM.